The Jesteress, the most expert YouTuber I know, just sent me this link to an exerpt from a Japanese TV game show, where contestants play “human tetris”. They’re the last block and must complete the game by fitting into the shape in the advancing wall. It’s a funny watch, but even funnier was what happened when I saved it to Delicious. 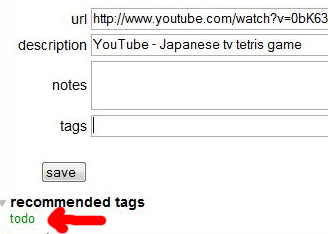 Delicious suggests the tags other users have used for any item you save; normally, it’s a very handy time saver, but as you can, its suggestion for this particularl video was…. “todo”. Blimey. I know it’s something of a passe meme to browse the web and conclude some people have somer strange hobbies, but… human tetris? Really? This entry was posted in Japanorama, Thought For The Day. Bookmark the permalink.